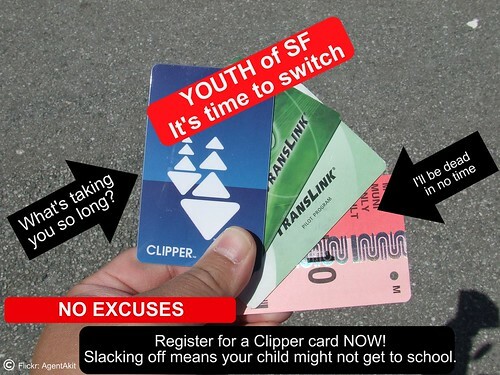 In just a little over a week, youth Muni passes will only be sold on youth encoded Clipper cards. That means, starting August 1st, August 2011 and beyond youth passes won't be in paper form. For those passengers who have a youth Clipper card, you can already pre-purchase your August pass right now at a local Walgreens, Muni metro ticketing machine, Presidio/Geary sales booth, and other locations around the Bay Area (except BART stations). But don't forget, the youth card's benefits goes beyond Muni, for those under 12 years old, they also get the youth discount on BART, and anyone under 18 gets the youth fare on all other participating transit agencies. SFMTA customer service during regular business hours (M-F 9AM to 5PM). Muni sales booth at Geary & Presidio (Everyday from 8AM to 8PM). Clipper customer service at Embarcadero station (M-F 5:45AM to 7PM, and Sat-Sun, 9AM to 2PM). Clipper customer service at Bay Crossings inside the Ferry Building (M-Sat 6:45 to 7PM and Sundays 9AM to 5PM). Please remember, proof of age is REQUIRED. Each card is customized to each person by having their birth date on their card. When they reach the legal age when they are required to pay the adult fare or pass, the card will automatically convert to an adult card. BE AWARE: If the student is eligible under the SF Unified School District (SFUSD) for a "Youth Lifeline" pass, a Clipper card is not required at this time. Click here (PDF document) from the SFUSD on information about the differences between the regular youth pass and the lifeline. Over 17,000 got their youth card. If the youth passenger hasn't obtained one, DON'T BE LAZY. No more excuses, and don't be like those whiners who had to switch from paper passes to Clipper for AC Transit. They were warned years in advance, and thousands slacked off until the last minute, and bitched and moaned at Clipper. It does seem nuts to me that they are doing this now in August rather than waiting until the fall. Surely it would be easier to distribute as many of these as possible through schools, which should already have proof of age on file anyway? No, I don't think it's nuts. Muni extended the deadline from January to August. Students had the entire summer to get their card. @Zach, I've asked Clipper directly, and the Clipper rep at MTA. Both have said that there are "logistical" issues by having school districts facilitate the distribution of the cards at schools. I suggested that school districts can utilize the Clipper as an ID card as well. Just a modified AC transit youth card.